A year ago, the Brett Favre backers were not in the majority, but their voices were certainly heard. Fast forward 12 months and trying to find somebody in Brett Favre’s corner is far more difficult. Favre signed a 2-year, $25-million deal with the Minnesota Vikings on Tuesday and that has apparently led many of the long-time Favre supporters to turn against him. Some fans are even going to drastic measures (picture) to show their disappointment. Favre is a manipulator. He’s become uncoachable. Favre thinks he’s bigger than the game right now. Brad Childress even picked him up at the airport on Tuesday himself. When the head coach is picking up the player at the airport, how can he be coached. While in Green Bay, Favre had his own office and private dressing area. He didn’t put himself with his teammates, he put himself above them. While his teammates parked their vehicles every day in the player lot, Favre rolled his truck right inside the tunnels of Lambeau Field. Yet the fans would only tell me he deserves it, for as much as he’s done for the Packers. Favre only did what he was paid to do, and paid quite well. He gives you that dumb country look, you know the one that has him show up in a 2-year old t-shirt with a hat that’s gone through 300 rounds of golf and 75 oil changes. His grey hair and 5-day growth on his face is nothing to look at. Yet, for many Packers fans, they worshiped the ground that this guy walked on. At one point in his career, he drank like a fish, was addicted to pain killers and was popular with the girls. All of it was overlooked because he threw touchdown passes and won games. Now, the same Brett Favre, the one that holds all of those NFL passing records and has led the Packers to a Super Bowl title, has put a purple #4 jersey on his back. Now that’s the final straw? It was OK when the Packers signed former Chicago Bear Jim McMahon, but it’s not OK for Favre to change his mind for the 18th time and sign with the Vikings? I can’t wait until Favre walks through the tunnel on November 1 at Lambeau Field. It’s your turn to let Favre hear it. Don’t disappoint me now. Let him have it. Show him that your loyalty can’t be kicked to the curb. Because in the end, and you may or may not realize it yet, the team is who you cheer for and not the player. 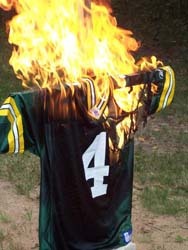 Favre will be gone and you’ll still be cheering for your favorite team, regardless of who the quarterback is. It’s all about the team, not the individual. I think you (Brett Favre fan) are finally seeing that, the hard way.